Jindai High School was a relatively safe place, right up until Sousuke Sagaka transferred there. A total nut, he wreaks havoc on the school’s student body and gets into a world of trouble with the teachers! But there’s more to Sousuke than meets the eye–not just a hell-raising student, he’s actually a member of an elite military unit, on an undercover mission to protect the beautiful schoolgirl Kaname Chidori from the KGB. Discover the mystery as this comedy-action-science-fiction story unfolds! I will just put an official forum here to see how many votes it gets. With the english license in Limbo after being abandoned when the original publisher shut down their US offices, we can only keep hope alive. Being complete just makes me want it more too. This series was previously licensed, so the question is, does Tokyopop (which never actually went bankrupt) still have any sort of rights to the series? As far as I know, Tokyopop lost all of their licenses' rights. That's why when it came back to the US scene, it had nothing. I want this sooo bad, would totally preorder the lot up front. I really want to see this licensed! You even got Amagi Brilliant Park so try to get this one please! Howdy all. With the anime series barely even covering half of the original LN series, and the TokyoPop translation only covering five measly volumes, there is a HELL of a lot of material left uncovered! Invisible Victory may have gone a little further into material that has yet to be translated, but in doing so they may have rekindled interest in the LN series. HOWEVER... that is going to be all the more reason for you guys to pounce on this sucker before someone else does!!! I'm pretty new here. First post, in fact! But I don't think I can exhort enough how time sensitive this just became with the release of FMP!IV. I hope that you guys do move on this soon. One day... One day someone will pick this up. 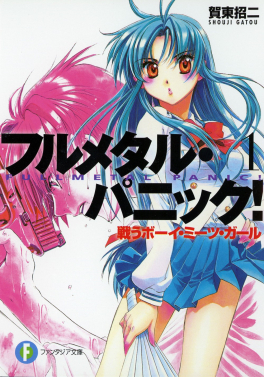 I really hope that JNC can at least translate Full Metal Panic! Another. It's a spin off series but it looks promising and there doesn't seem to be anyone else who has translated these books even as a fan translation.